One fun thing about having a toddler is getting to see how excited he gets when he's out seeing things. This year he has gotten into Christmas, so we've been taking him to different places to see the lights and decorations. 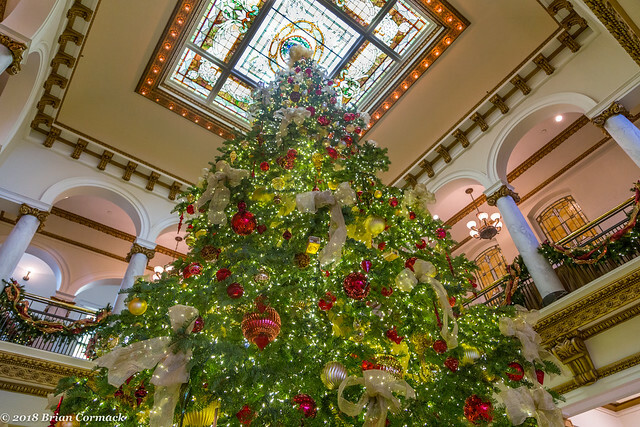 Last weekend we headed to the historic Capitol Hotel in downtown Little Rock, which features a massive Christmas tree in its lobby. Jonah happily screamed when he saw it (much to the presumed delight of the other visitors, sorry Capitol Hotel). If only the tree had Paw Patrol ornaments on it, it would have blown his mind. The tree is a 30 foot tall white fir, and has about 15,000 lights on it. The tree is so tall that it nearly touches the ceiling of the second floor. From there we crossed the street and went inside the Marriott Hotel, which had some Christmas decorations up. 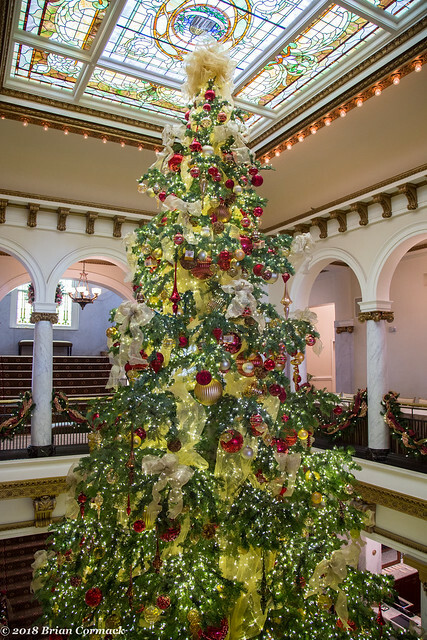 But their Christmas tree didn't seem as tall as the one in the Capitol Hotel, which granted you'd probably need to have a redwood tree there in order to reach the ceiling. The next night I swung by the State Capitol around sunset. A tiny bit of golden light was left in the sky, which was being reflected back in the glass of the downtown towers. And another view looking east towards the skyline, showing some cracked pavement. Which is a little infuriating to see, since my car is currently in the shop after I drove into a massive pothole which ended up bending the wheel. 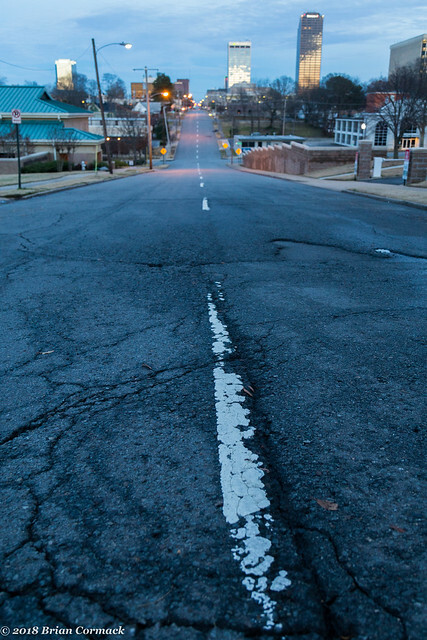 Should I send the bill to the city of Little Rock to pay since they've gotten lazy about patching all the potholes? 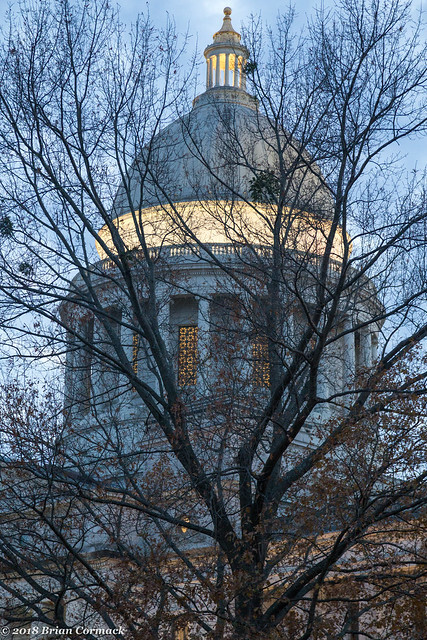 And a view of the Capitol dome, as seen through one of the many trees on the grounds. A few minutes later, the 55,000 lights on the Capitol were switched on. 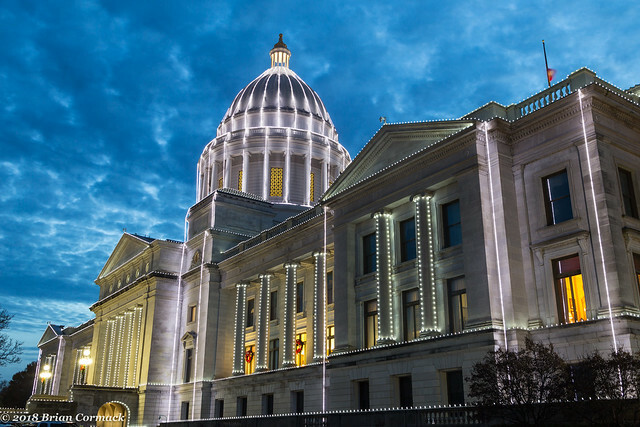 The Capitol has been lit by lights since 1938, a tradition which was started to help lift the spirits of the kids who were staying at the nearby Arkansas Children's Hospital. 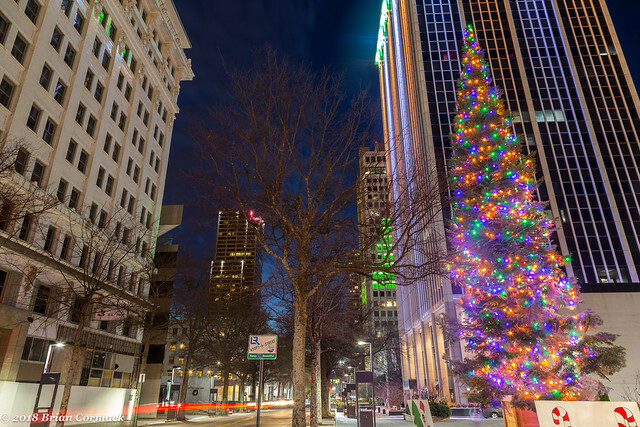 If you head down Capitol Avenue from here, you'd soon reach the Little Rock Christmas Tree (at Capitol and Main Street). 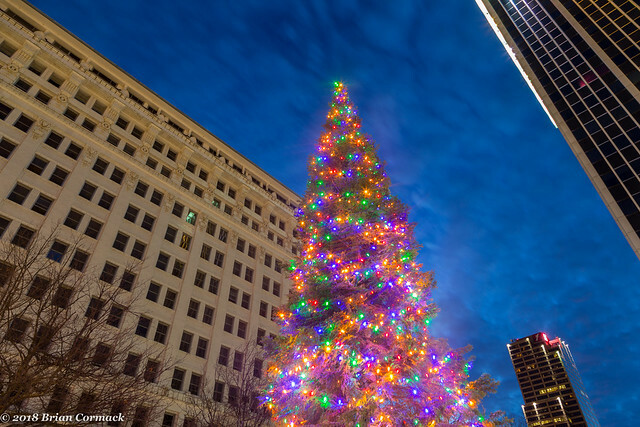 The city's tree reaches 65 feet, but it does seem overshadowed by the buildings around it. From there I headed a few blocks north and caught a ride on the Metro Streetcar as it slowly made its way through downtown. There weren't any other passengers on board, so I set the camera up on a tripod and tried to take some long exposures of the city lights passing by the trolley windows. 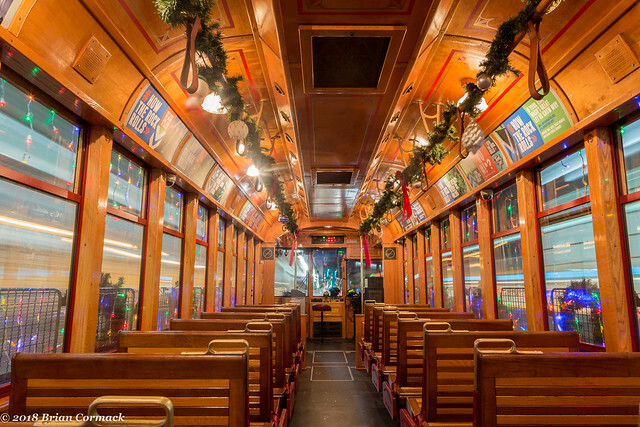 The streetcars are decorated for the holidays, with lights and garland and even some ornaments that swayed as the trolley lumbered down the road. 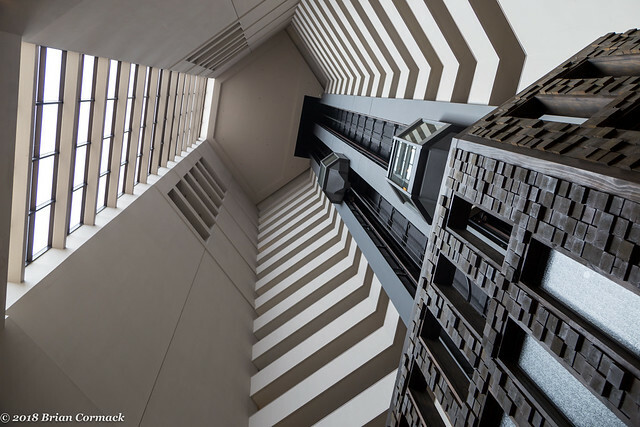 These shots were taken around the Capitol Hotel and the Statehouse Convention Center. 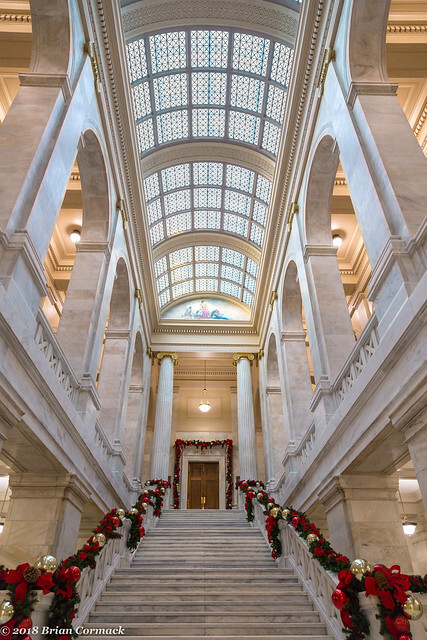 I made a return visit to the Arkansas State Capitol last week when it was fairly quiet there. 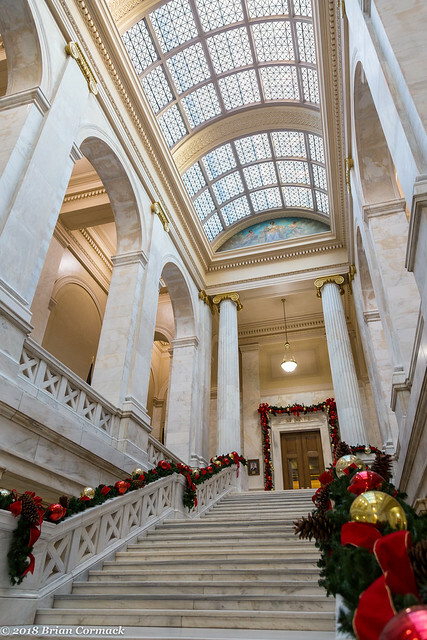 The halls of the capitol has been decked with all sorts of holiday decorations, but there weren't many people there. Just a few people doing some preparations for the upcoming legislative session were milling about. The workshop where Santa sits in the Rotunda during the month of December was empty, I guess Santa was out adding some of our state legislators to the naughty list. The capitol was built between 1900 and 1915 and cost around $2 million. The state capitol is a historic and dignified building. 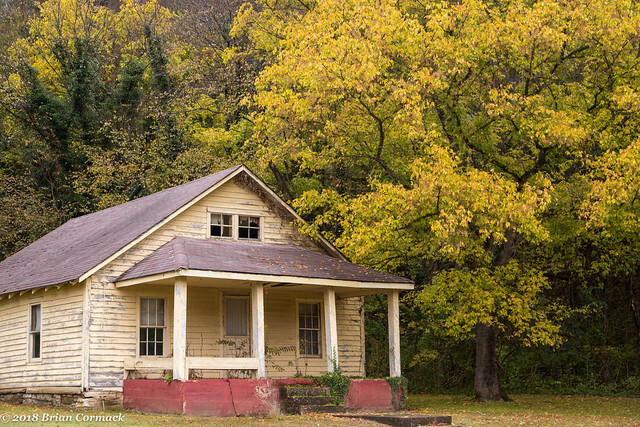 It has been the home some of our state's greatest governors - Dale Bumpers, Bill Clinton, and Win Rockefeller (but also home to some of the worst like Orval Faubus or Mike Huckabee). 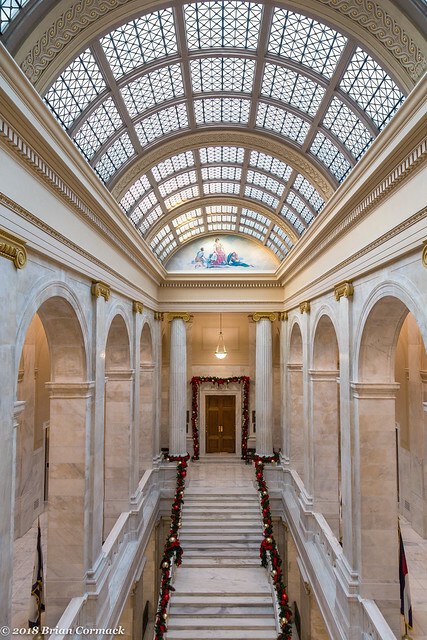 One of my favorite bits of history about our State Capitol is that it was used as a filming location for the 1991 cinematic classic Stone Cold, starring Brian Bosworth (although it is embarrassing, since they use our capitol for a film that was set in Mississippi). The climax of the movie has gun fights in the old Supreme Court chambers and motorcycles speeding through the marble halls of the building. At one point a motorcycle is actually shot out of a window from the 4th floor where it hits a helicopter, resulting in a fiery explosion on the capitol grounds. The fire inadvertently caused a magnolia tree to catch fire, which had to be cut down afterwards. But it is kinda amusing to imagine Brian Bosworth running around filming those scenes in the Capitol while Bill Clinton was sitting in the nearby governor's office plotting his upcoming run for the Presidency. It's a shame he didn't pick Bosworth to be his Vice President. 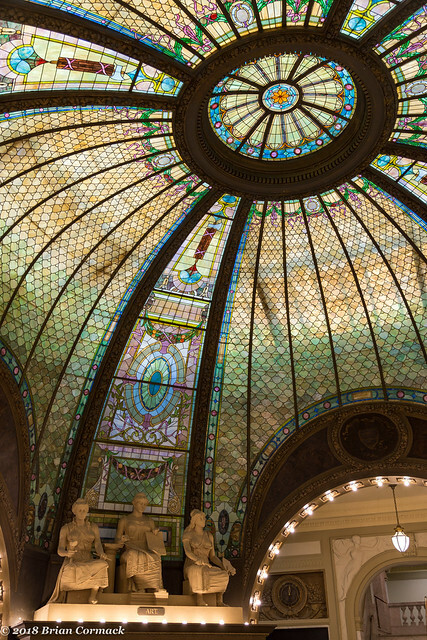 The impressively ornate lobby of the Pulaski County Courthouse might be missed by most visitors, who trudge through on their way to jury duty or to court. 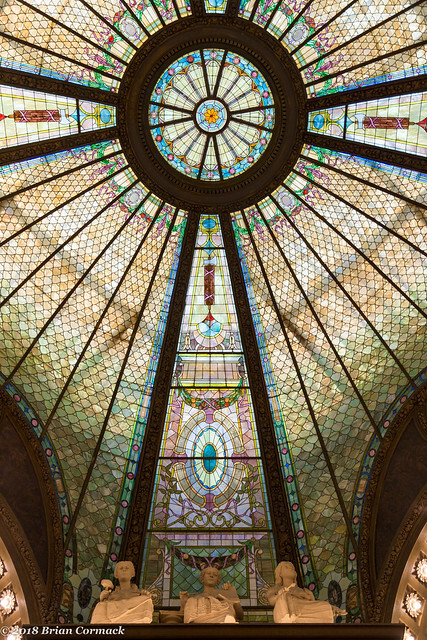 But the lobby and rotunda, constructed of limestone and capped by a stained glass dome, is worth taking your time to see. 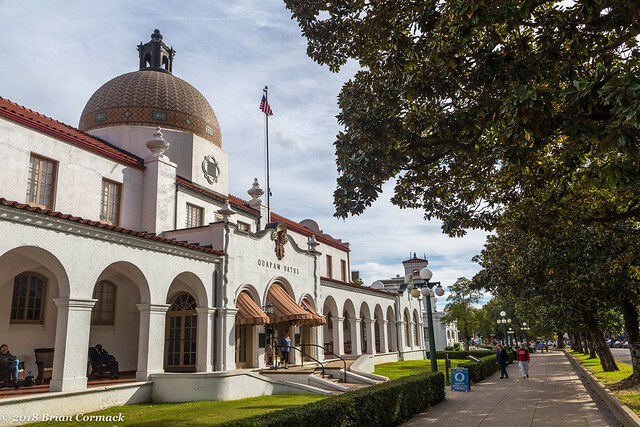 The dome and the courthouse were constructed in 1914, and were designed by noted architect George Mann (who also designed several bathhouses in Hot Springs, the Arkansas State Capitol and Little Rock Central High School. The rotunda is guarded by twelve statues, which are meant to portray agriculture, machinery, justice and art. 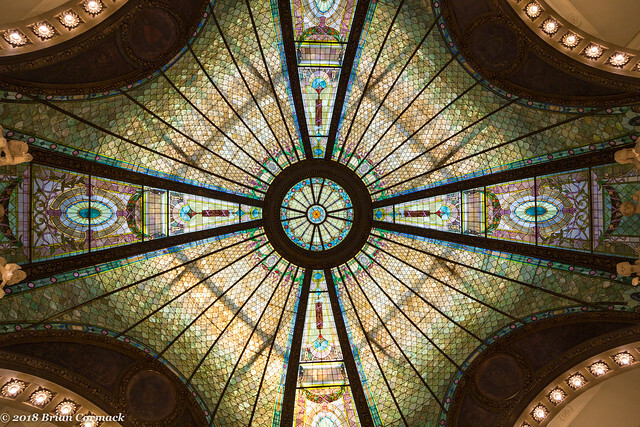 And the view from the rotunda, looking up at the stained glass dome. While I was there, a couple was nearby getting their pictures taken after they had gotten married at the courthouse. 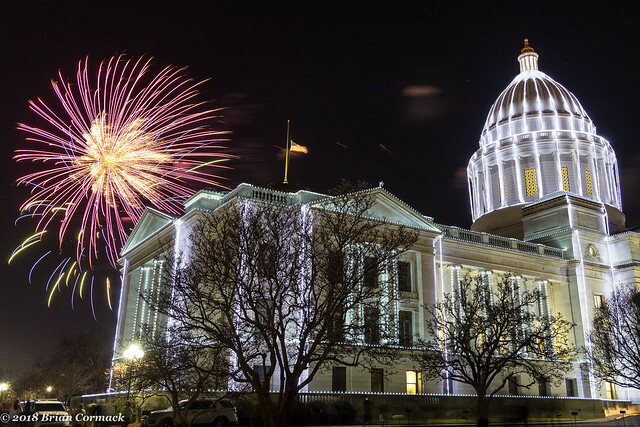 Every year, Arkansas is kind enough to have a little fireworks display right after the 100,000 holiday lights are switched on at the State Capitol. It's a great event, there are tons of families and people out to see the show (it also coincides with the end of the Little Rock Christmas Parade). And of course, it's also a great event for photographers. The show this year was a little different. Usually the fireworks are launched from right behind the Capitol building, but this year they were moved farther back (maybe for safety? It was really windy earlier that day). Which resulted in the fireworks themselves looking smaller, where even some of the fireworks ended up being obscured by the capitol building. Hopefully next year they move it back closer. Anyways, here's one of the shots I managed to get. We were already set up by the side of the building and after the fireworks started, people began hurrying over by the side to get a better view. 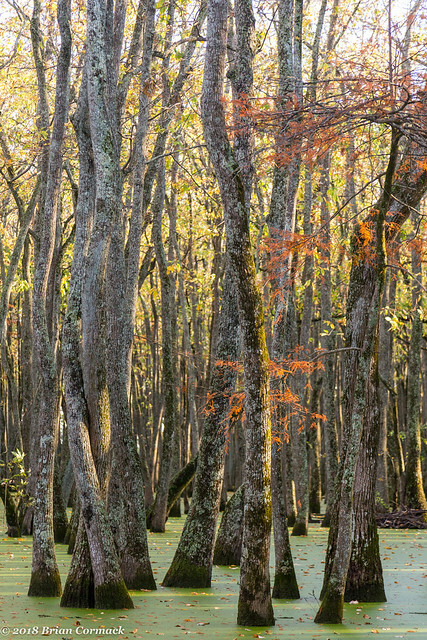 A few weeks ago when the fall colors were near peak, I met up with my friend John and we went out to visit some neat areas out around the small town of Keo. 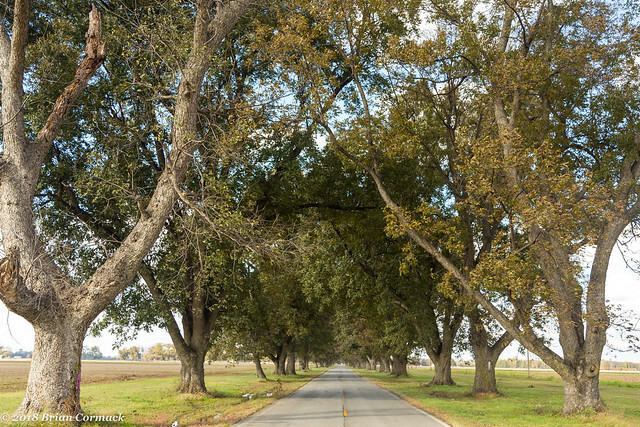 Along the way, we made the traditional trek through the tunnel of pecan trees near Scott. 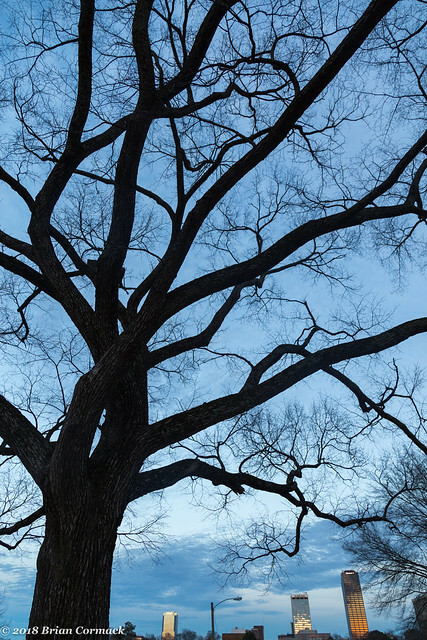 The trees are over a century old, and were planted as part of a large plantation. We also stopped at an old church and got a few pictures. The church is abandoned now, except for a large congregation of dirt daubers. 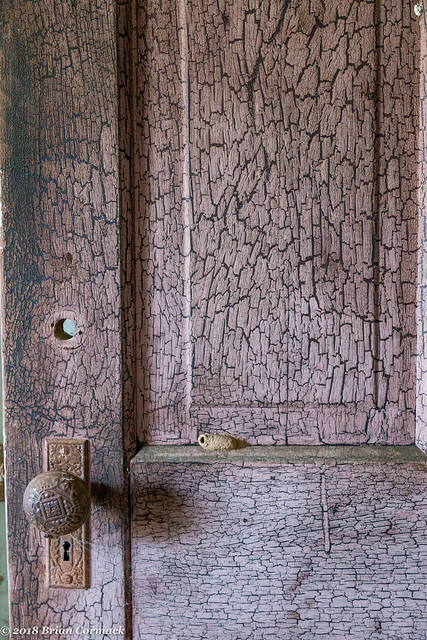 The wasps built thousands of nests inside the church - along the ceilings, the walls and windows. 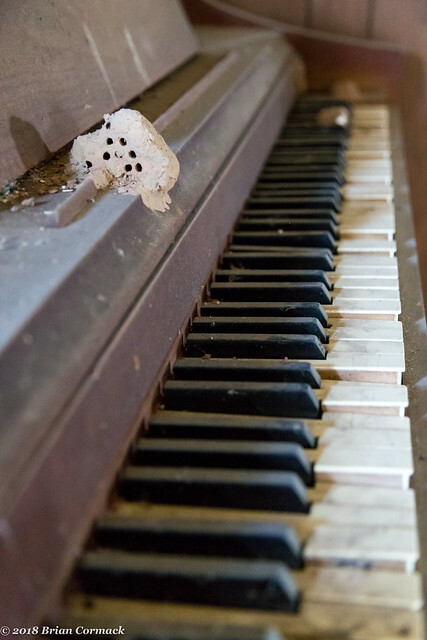 Heavy mud nests weighed down the blades of a ceiling fan, and even were built right along the edge of an old piano. Luckily the wasps were long gone (apparently they don't sting, but I didn't dare find out how true that was). And another room in the old church - note the dirt dauber nests built on the window curtains. The desk in the pastor's office was still covered in papers, including a check book. A calendar on the wall was from 2008, which means all the damage to the building (including a collapsed roof) has occurred in just ten years. 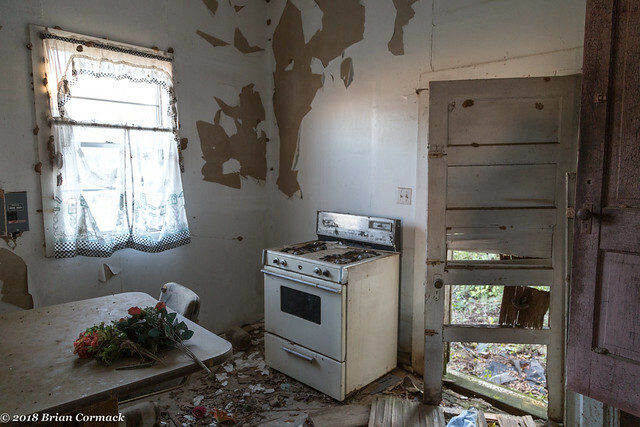 It's amazing how quickly nature works to reclaim its territory. 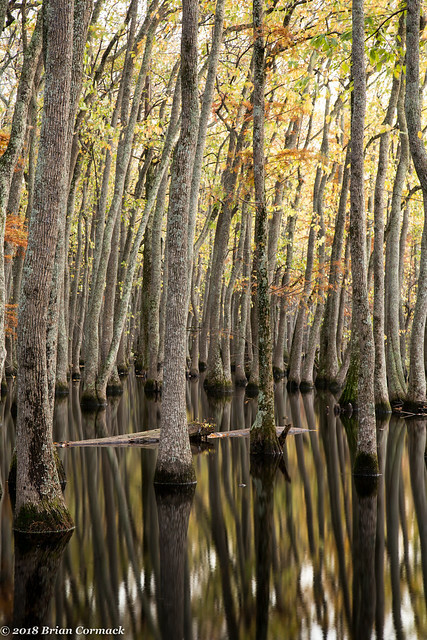 Just down the road is a small lake that is just absolutely filled with tupelo trees. 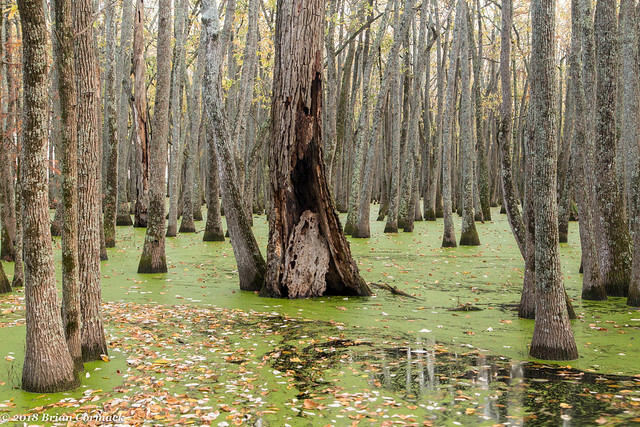 It's also filled with lots of duckweed, the tiny floating plant that looks like a smooth green carpet floating on the water. 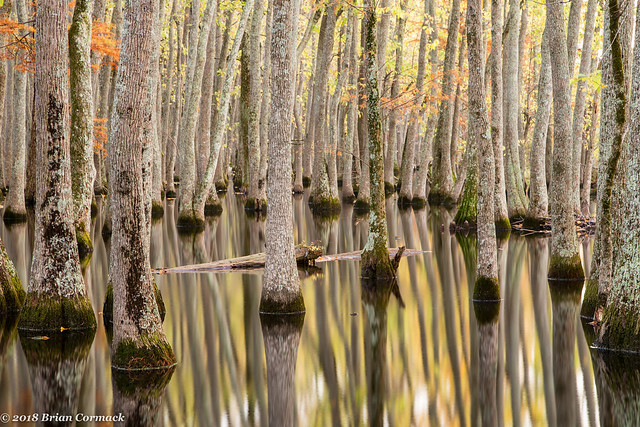 It's a beautiful spot, especially as it got closer to sunset and golden light began to filter through the trees. 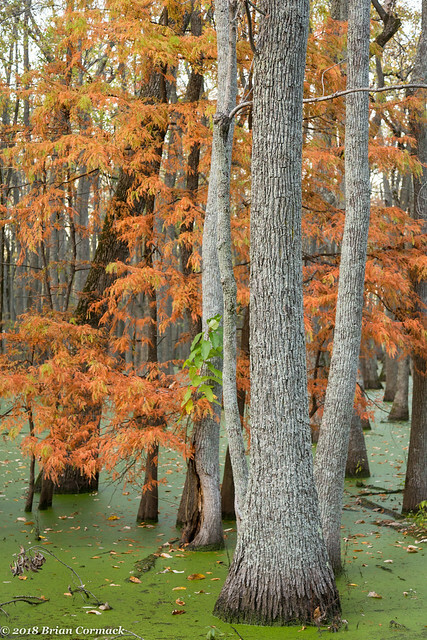 There were a few cypress trees there too, which were showing off some good fall colors as well. 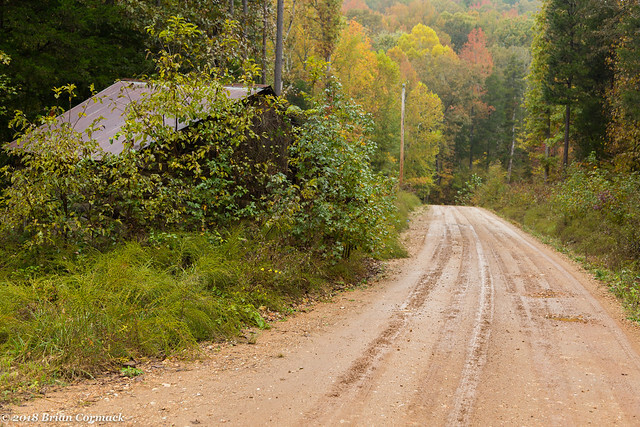 It is one of my new favorite places to take pictures, a gravel road provides easy access to the lake. 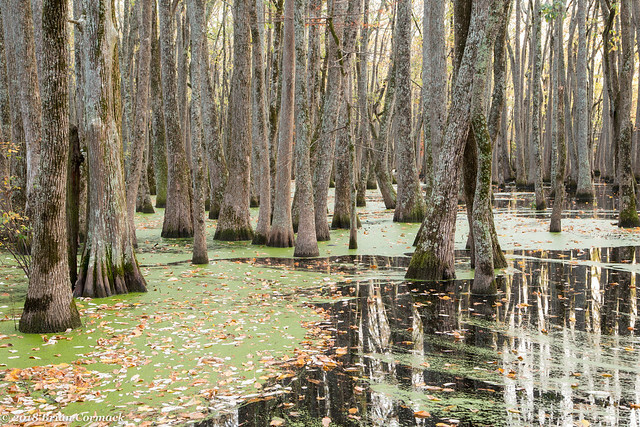 The road is also slightly elevated, providing a small buffer from any snakes or gators in the water. 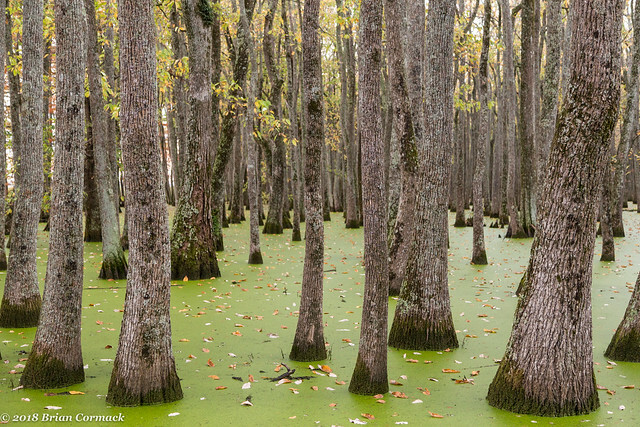 And the abundant quantity of duckweed prevents mosquitoes from laying eggs (it is a relief to be in the Delta and not be bothered by mosquitoes). We stayed out there until it started to get too dark for pictures. 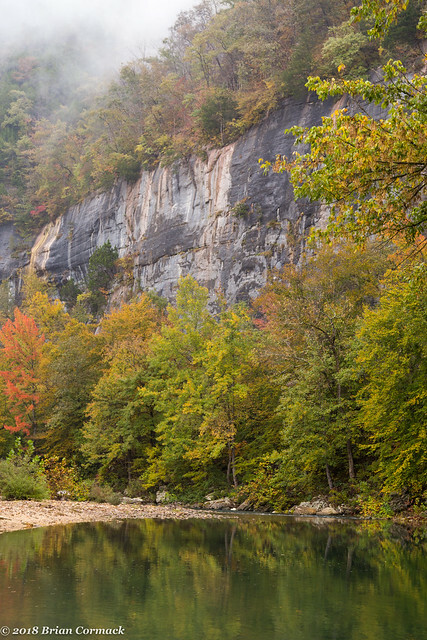 While the fall colors were still at their peak, we decided to take a little family trip down to Hot Springs for the day. 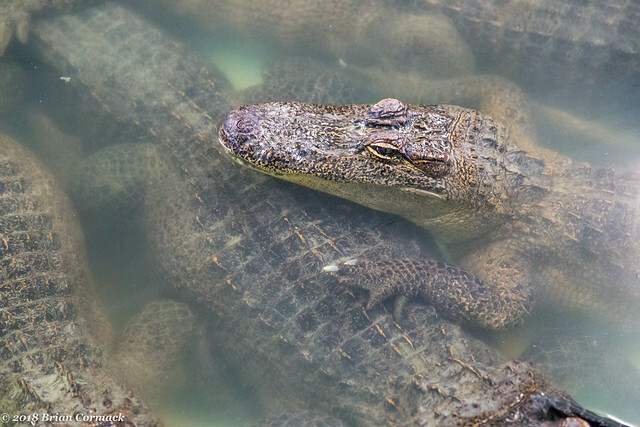 During the drive down, we looked up what some fun things were for kids to do and ended up taking Jonah to the Alligator Farm and Petting Zoo. The zoo first opened way back in 1902, and well it seems like it hasn't really been updated much since then. 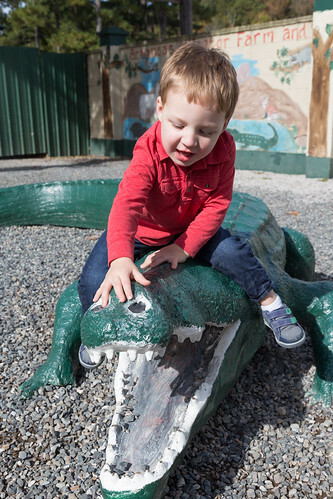 But I think that Jonah enjoyed himself there, he got to feed the gators (and didn't end up as a gator snack). After that we headed downtown and got lunch at an amazing pizza place - Dead Head Pizza. From there we strolled along Central Avenue, and then along Bathhouse Row. The weather was great, and there were lots of people out and about. I took a few pictures of the bathhouses, here's a view of the Quapaw Bathhouse. 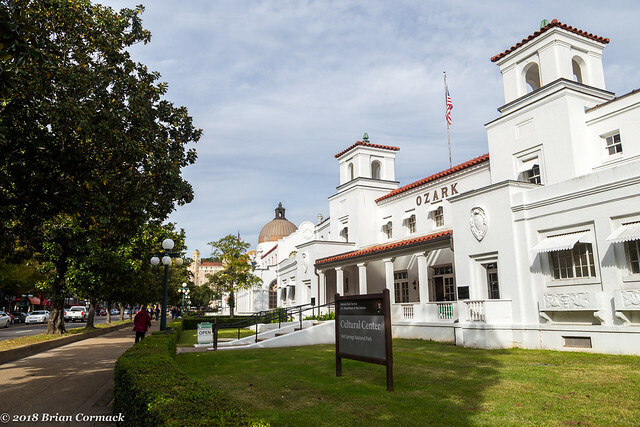 The Quapaw was built in 1922 and is still used as a spa. Next door is the Ozark Bathhouse, which also constructed in 1922. 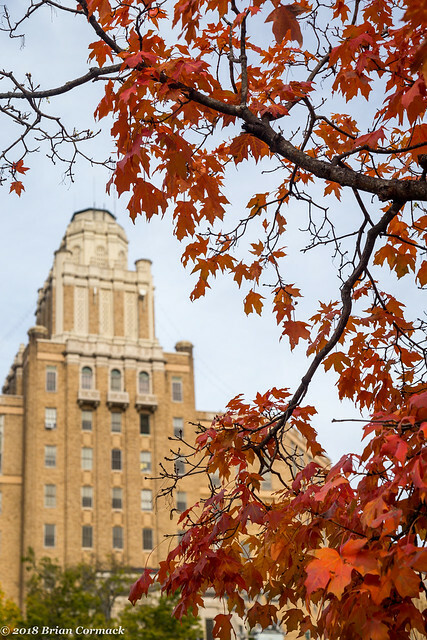 The fall colors were great - this bright tree stood along Central Avenue, near the old Army and Navy Hospital (which was built in 1933 and is now a rehabilitation center). We then strolled along the Grand Promenade, which runs along the hillside above the bathhouses. 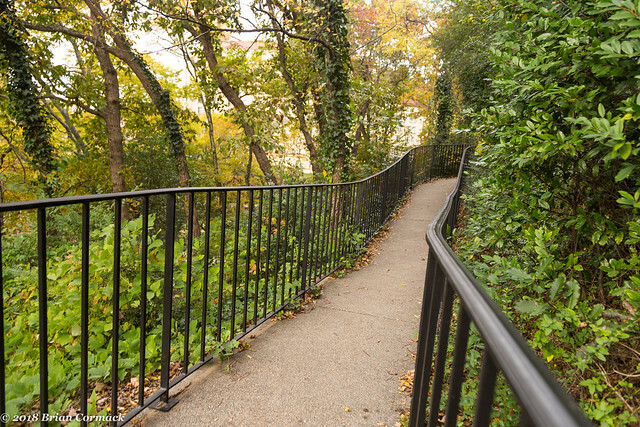 It is a nice quiet place to walk, especially since it allows a toddler to run without having to worry about any traffic. 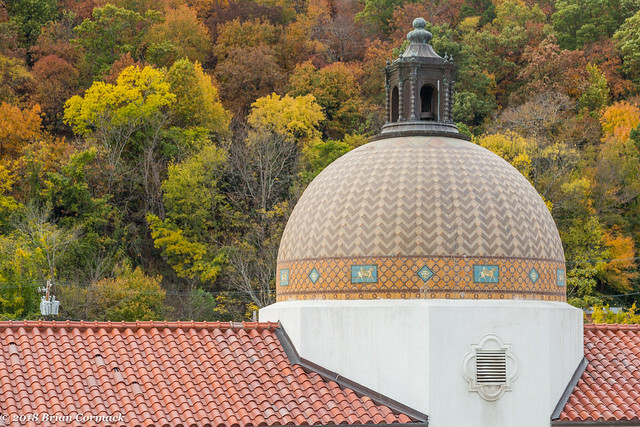 It also provides some great views of the bathhouses, including this view of the Quapaw Bathhouse's dome and bronze copula. And one last shot - before we headed home we drove along the North Mountain Loop, which provided this great view of the fall colors. 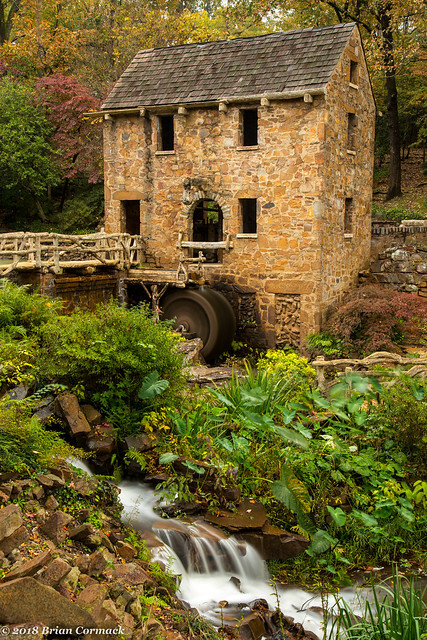 One night after work I hurried across the river to North Little Rock to try to get some pictures at the Old Mill before it got dark. The fall colors weren't as vivid there as I had hoped they would be, but the recent heavy rains did provide plenty of fuel for the small waterfall there. 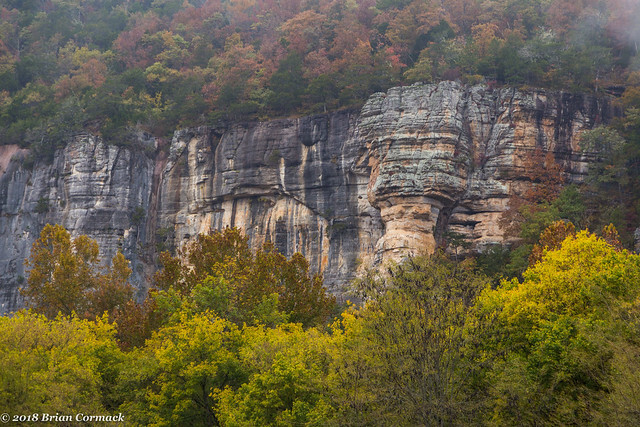 On Halloween Day, I left work on my lunch break and made the short drive to Pinnacle Mountain State Park. 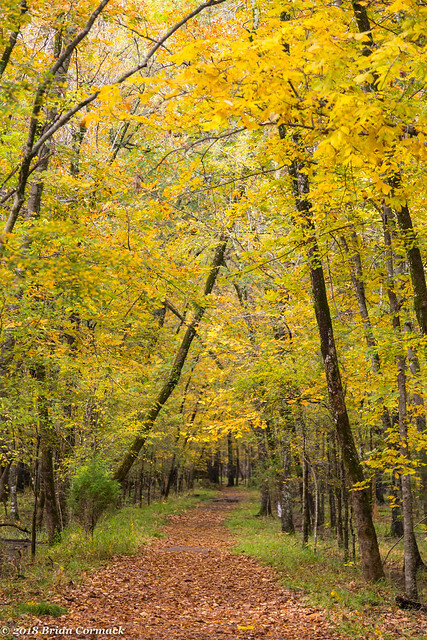 I had just enough time to walk the short Arkansas Arboretum Trail, which was looking quite vivid with all the fall colors. It had been raining all day, but I somehow lucked into going during a short break in the rainfall. 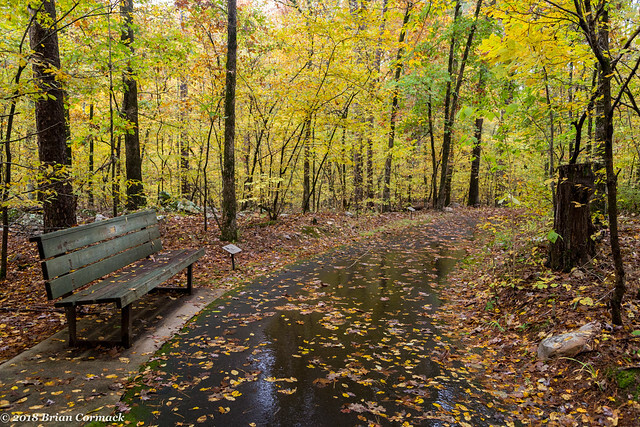 The wet weather did help in saturating the color in the trees, which I attempted to capture with the camera before heading back to work. 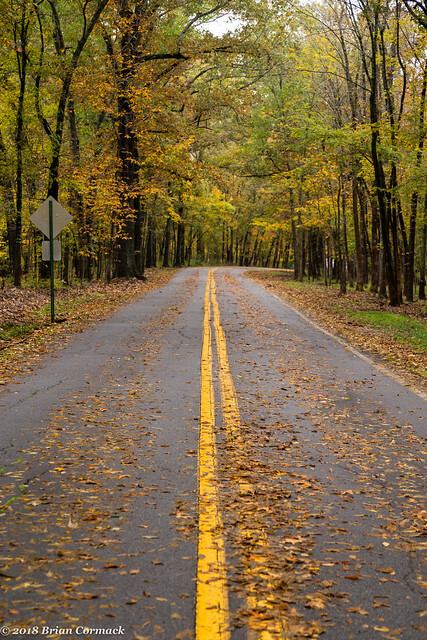 I headed out to try to get a few more fall color pictures, and ended up driving through Burns Park in North Little Rock. The first stop was the old cabin, which was actually built before the Civil War. 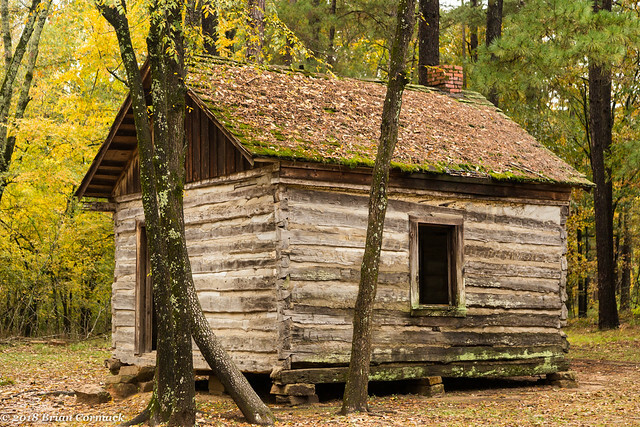 The cabin was the home to some of the earliest settlers in the area, who ran a shop along the road running between Little Rock and Fort Smith. The cabin was located outside of the park and was in rough shape, and in 1972 was transported to its current location (which is a good spot, it's right by a small cemetery where some of its former inhabitants are buried). 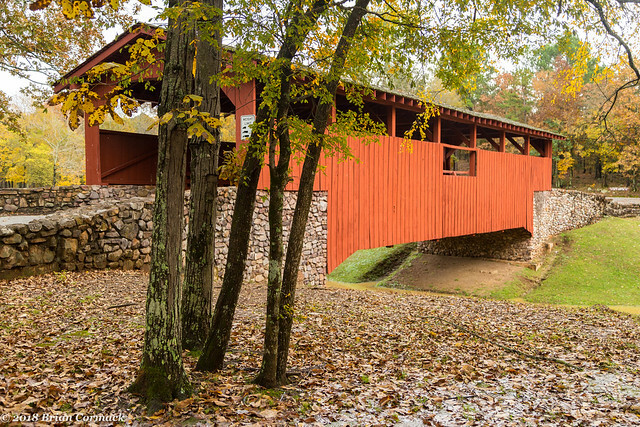 Just down the road is the covered bridge, which as a NLR native I can say that we are all contractually obligated to have our pictures taken here at least once (along with the Old Mill). 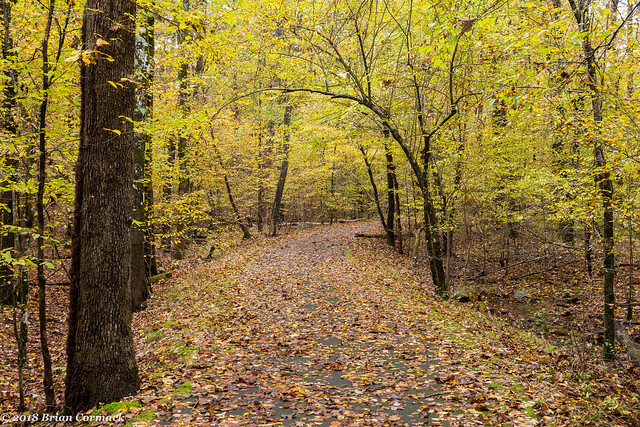 There are a few hiking trails in the park, including this one that runs past the covered bridge. Burns Park is the largest municipal park in the state (growing up in Dogtown we were told it was the largest in the country, but I'm guessing that might not exactly be true now). 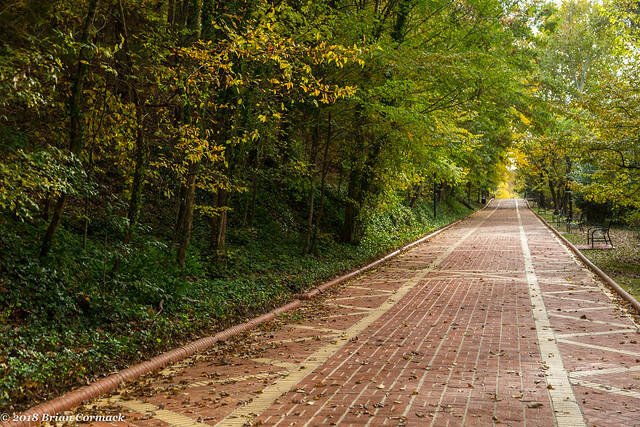 The land was donated to the city by the army, who used it for training during World War I. The park is still home to the rocket slide, numerous playgrounds and places for soccer, tennis and baseball. 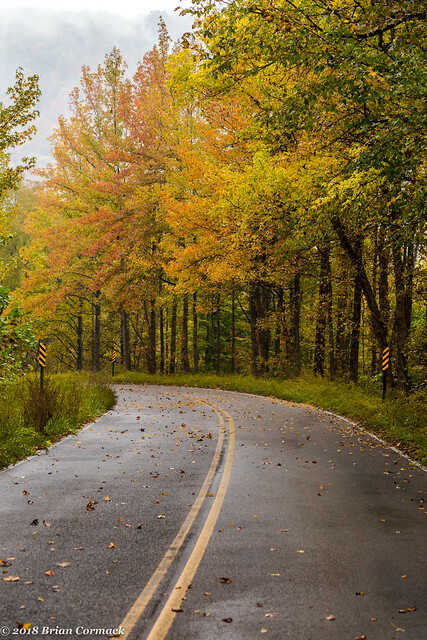 This was taken along one of the roads in the park, on a rainy day. One good thing about my work (besides the fact that they give me a paycheck) is that our office is located way out on the western fringe of Little Rock. It means I don't have to fight traffic while heading downtown, and also that the office is conveniently located to places that are great for taking pictures. 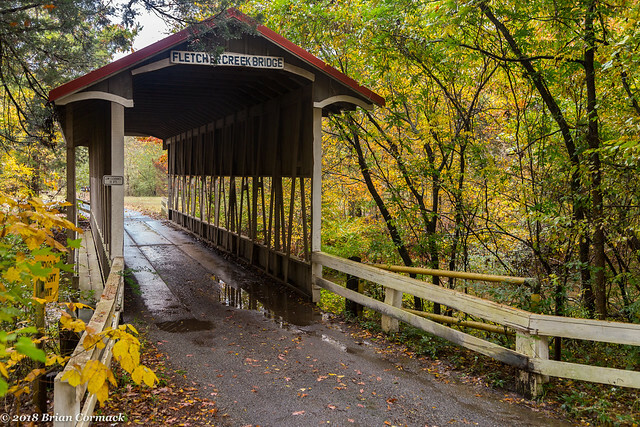 One such example is this covered bridge, which I drove out to visit during my lunch break on a rainy day last month. 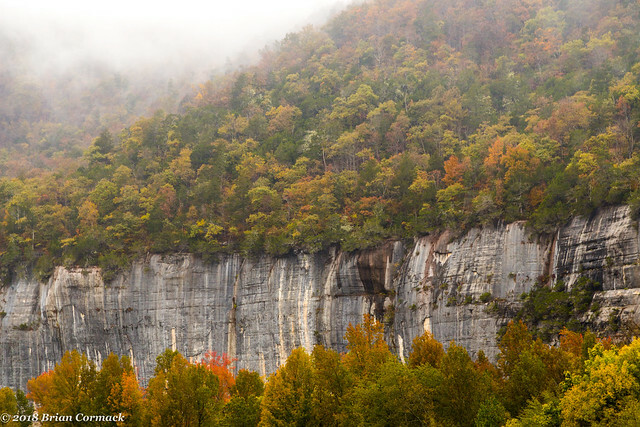 The fall colors were nearing peak, and were also saturated a bit by all the rain. 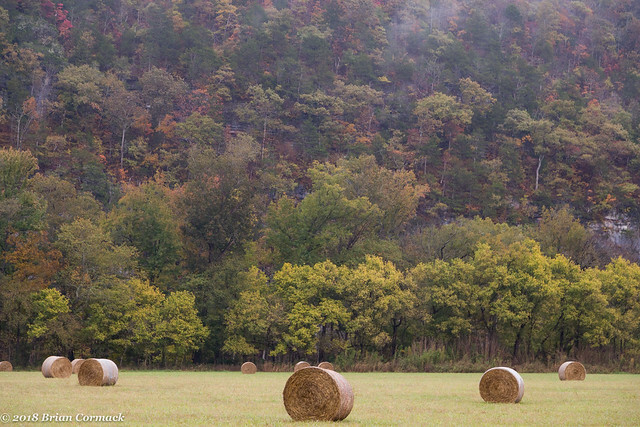 I had made all sorts of optimistic plans for the morning, where I would quickly drive across several beautiful spots along the Buffalo River before we had to check out of our cabin and return home. But of course, I ended up forgetting to set my alarm and I overslept. So after waking up I sleepily grabbed the camera and managed to make it out of the cabin with some time remaining to take a few pictures. The conditions were perfect (at least for photography). 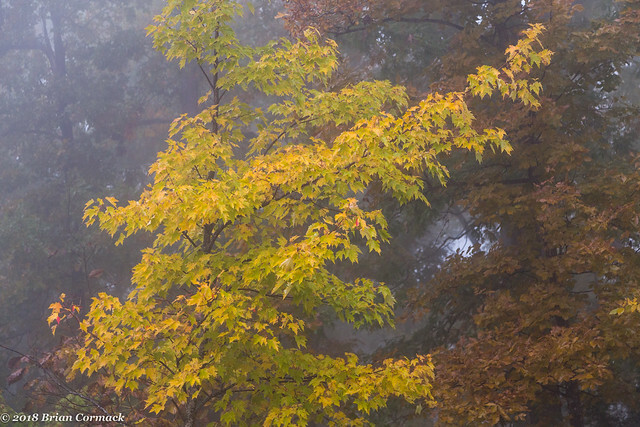 Thick fog had shrouded the mountains, and a light rain was saturating the fall colors. It was one of the days that you just wanted to stop every five feet to take pictures of something different. 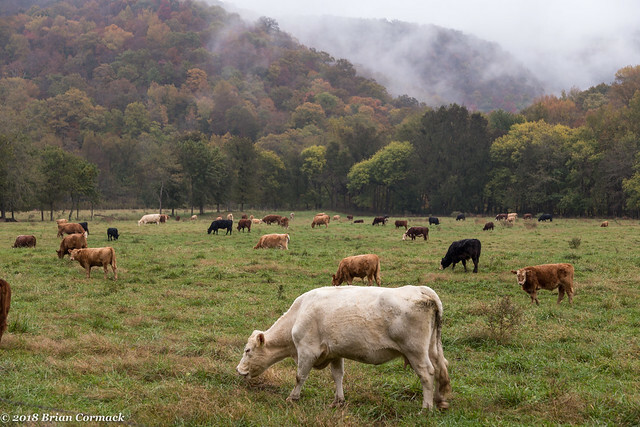 I ended up passing through Boxley Valley again, and made a few stops at some places that I missed the day before. 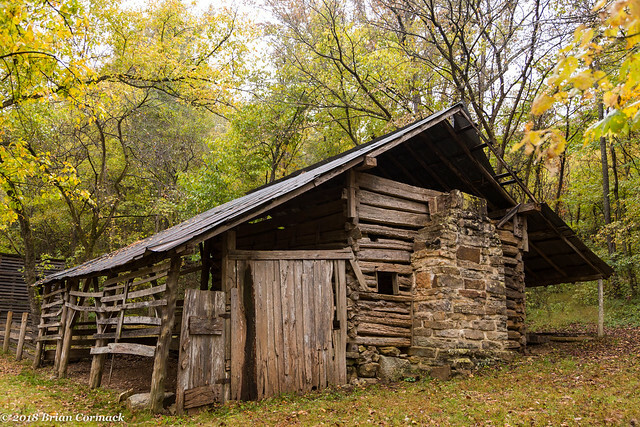 This is a shot of the old Villines Cabin, a log house that is believed to have been built in 1853. 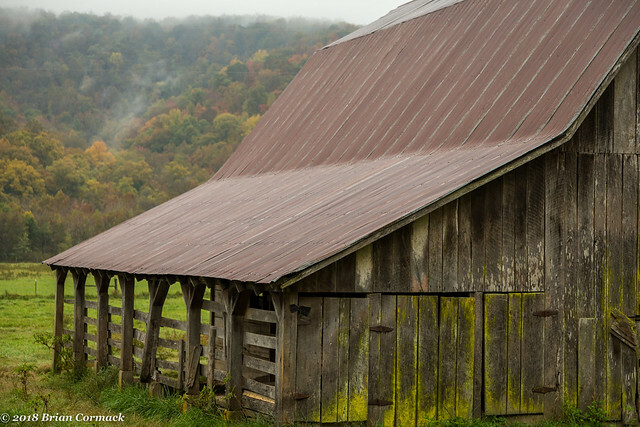 The house eventually was used as a barn. 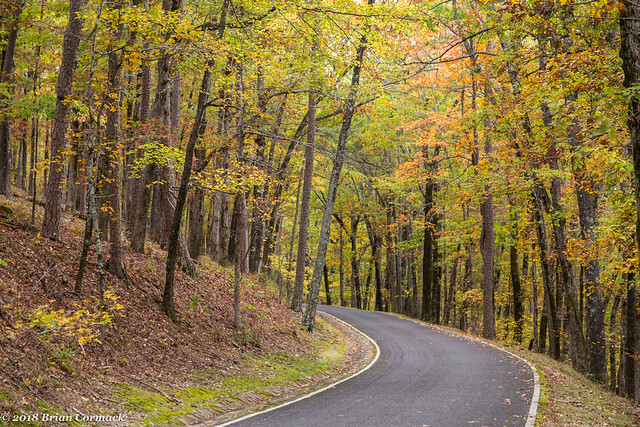 From there I headed back over to Steele Creek, slowly following the curvy road down to the river. 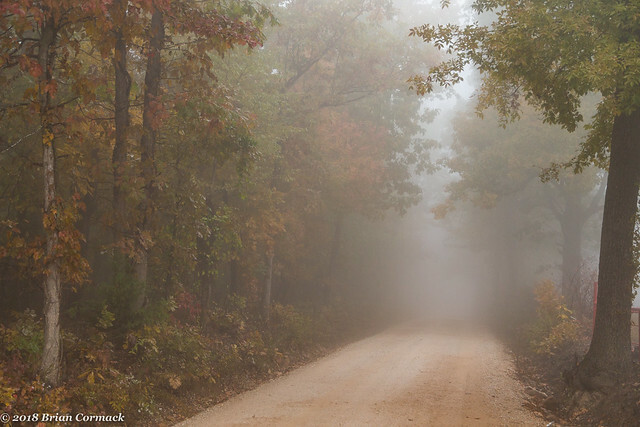 The thick fog was clinging to the top of the mountains, while the river and the campground was still pretty quiet. On the way back to the cabin I followed a dirt road which passed by this old building, nearly obscured by trees and brush. And one last shot, taken while heading back to the cabin. 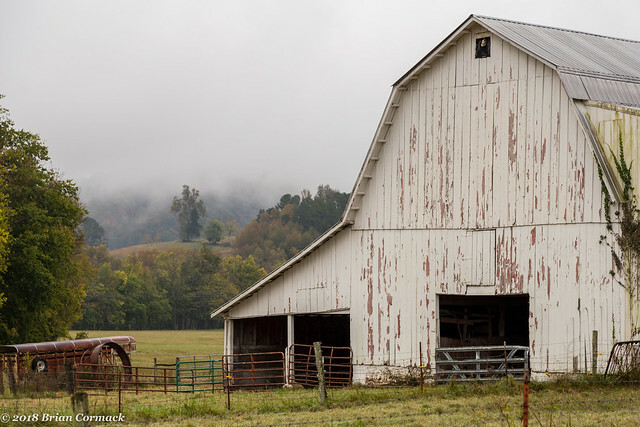 This old white barn sat right by the road, with a perfect view of fog-covered hills behind it.